Although kinase inhibitor (KI) therapies such as ibrutinib are generally well tolerated, intolerance is the most common reason for discontinuation (~50%, Mato et al, Blood 2016). Therefore, patients (pts) who respond to a KI but discontinue due to intolerance represent an unmet medical need. Umbralisib (TGR-1202) is a novel, highly-specific PI3K-δ inhibitor that also uniquely inhibits CK-1ε (Casein Kinase-1ε). Umbralisib is well-tolerated with a discontinuation rate due to Adverse Events (AEs) of < 10% as demonstrated in a safety analysis of 347 pts (Davids et al, ASH 2017). This trial evaluates the safety/efficacy of umbralisib in CLL pts who are intolerant to prior BTK or PI3K-δ inhibitor therapy. KI intolerant is defined as: ≥ 1 grade 3 or ≥ 2 grade 2 non-heme toxicities, ≥ 1 grade 3 neutropenia with infection or fever, and/or ≥ 1 grade 4 heme toxicity leading to KI (BTK and/or PI3K inhibitor) discontinuation. Toxicities must resolve to ≤ grade 1 prior to umbralisib. Prior KI must be discontinued for ≥ 14 days without CLL progression; however, pts could have progressed after 14 days of KI discontinuation. Pts must start umbralisib within 12 mos of discontinuing prior KI. All pts are treated with umbralisib (800 mg oral daily) until progression, toxicity, or study conclusion. The primary endpoint is progression-free survival (PFS). Secondary endpoints include duration of response, time to treatment failure, and umbralisib safety profile. Peripheral blood samples are being collected for correlative analyses to identify markers associated with KI intolerance. 40 pts were treated as of 2/2018 (36 BTK & 4 PI3Kδ intolerant). Baseline demographics include: median age 69 yrs (range 52-96), median prior therapies 2 (1-7), 55% were male, ECOG 0-1 (92%), del17p (20%), del11q (23%), IGHV unmutated (60%). 80% required treatment within 6 mos of prior KI discontinuation. Most AEs leading to prior KI discontinuation were: arthralgia, rash (9 events each), A-fib (6 events), diarrhea (4 events), bleeding, fatigue and weight loss (3 events each). 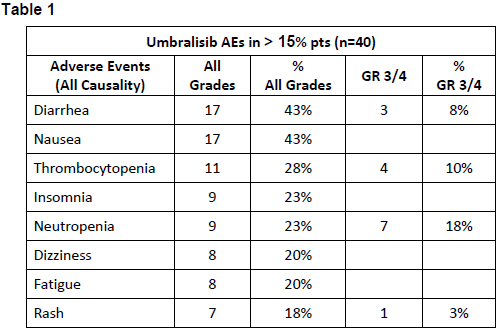 AEs reported in 40 patients on umbralisib (regardless of causality) are listed in Table 1. Common GR ≥3 PI3Kδ-associated AE’s were limited: AST/ALT elevation (3%); diarrhea (7.5%); rash (3%). Four pts discontinued umbralisib due to intolerance (rash, pneumonia, pneumonitis, pancreatitis), and 1 patient due to study noncompliance. No patient has discontinued umbralisib as a result of a prior KI intolerant AE, and only 4 pts had recurrence of an AE that led to intolerance on their prior KI, however all recurrences were of lesser severity, and none led to discontinuation or dose-modification of umbralisib. Three pts (7.5%) had dose reductions (headache, hematologic, and colitis) and were successfully re-challenged (colitis patient on study in PR now 12 mos). Median PFS has not been reached with 90% of pts progression-free at a median follow up of 7 mos (range 1–16). No deaths were observed. Umbralisib appears to be safe and effective in a KI intolerant CLL population. These are the first prospective data to confirm that switching from ibrutinib, acalabrutinib or idelalisib to an alternate PI3K-δ (umbralisib) can result in durable responses without recurrence of prior KI intolerance toxicities. Pre-umbralisib dosing samples are being analyzed for BTK resistance mutations and CYP-3A4 polymorphisms. Study enrollment is expected to be completed with 50 pts by the meeting.